Over forty mammals, thirty reptiles and amphibians, and two hundred and seventy birds call Algonquin Park home. No matter what time of year you visit Algonquin Provincial Park, you will see plenty of wildlife. In fact, Algonquin Park is one of the best wildlife viewing areas in the province year round. Visitors to Algonquin Bound looking for good spots to see Algonquin Park moose will not be disappointed. Distinguished by their large snout and impressive size, they are commonly spotted in wetlands next to many lakes and portages in the park. Adding to the wilderness feel, Wolf howling is a regular attraction for West Gate area visitors. There are regularly planned wolf howls through the year and, in the interior, you can sometimes hear wolves howling in the evenings. Although many people want to see larger mammals like moose, deer and wolves, spotting a salamander on the forest floor or a painted turtle on a log from your canoe can be equally inspiring. These sightings can make some of the best Algonquin memories! Of all Algonquin wildlife, moose are typically the most sought after species to see on any Algonquin Park canoe or camping trip. The moose population in Algonquin is healthy and there are plenty of opportunities to see this majestic creature throughout the park. 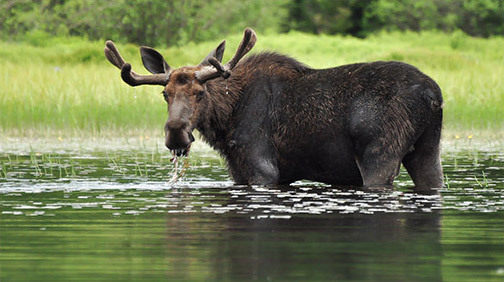 In the spring, the Highway 60 corridor through Algonquin is a great spot to find Algonquin moose. They love the new sprouting plants in the ditches and open areas and come out in force to feed. Even in summer, moose are often spotted along the highway, with the best times being in the early morning and evening. There is nothing more impressive than spotting a moose from your canoe or kayak. Despite their size and dark colouring, moose can still be elusive to the eye. To increase your chance of spotting one of these fantastic creatures, look for tracks leading down to shoreline areas and visit these areas early in the morning or around dusk. Wolves are perhaps the most difficult mammal to spot in Algonquin Provincial Park. Naturally shy of humans, they are extremely elusive and are rarely seen in the wild. Virtually all Algonquin wolf sightings occur when a wolf crosses the highway or an Algonquin Park interior access road while you are driving. When paddling a canoe or kayak in Algonquin’s interior, odds are you will not see a wolf. However, there is a good chance you will hear these beautiful animals. Although they can be heard throughout the year, the best time is in the middle of summer and into the fall. 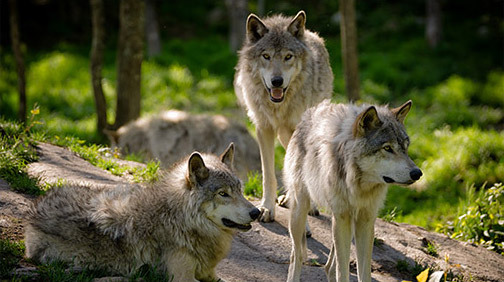 They typically howl at dusk or at night, but sometimes you can hear them early in the morning as well. Their howl will certainly add an element of excitement to any Algonquin Park camping experience. Beavers are everywhere in Algonquin Provincial Park. 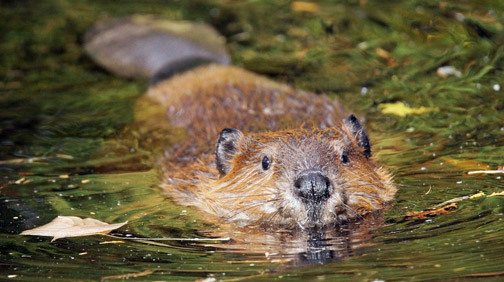 Whether you are on a hiking trail, paddling the interior or simply driving on Highway 60, the telltale signs of beaver are easily seen next to most waterbodies. There are some amazing dams and beaver houses found on most Algonquin lakes and especially rivers and streams. While beavers are somewhat shy, they are often spotted paddling along lakes and rivers in Algonquin. They are always busy, building or repairing their dams and homes and a canoe or kayak is the best way to get up close to these structures. Don’t worry about getting too close as they will stay clear of you, and will certainly let you know if you are intruding with a big tail slap on the water! Algonquin is home to a multitude of snakes, frogs, toads and various amphibians. Frogs are usually the easiest to spot, while the more elusive creatures like snakes and salamanders are a realtreat to see. Adding to the Algonquin Park experience is the resounding sound of frogs croaking at night as spring peepers and bullfrogs back them up, creating quite the chorus. 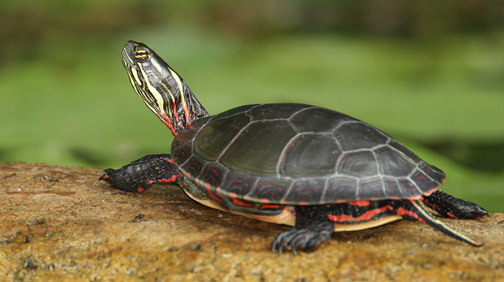 Turtles also abound in Algonquin park and are best spotted while paddling in a canoe or kayak along shorelines. The rare wood turtle has a relatively healthy population in Algonquin and there are great efforts in place to preserve this unique species. One example is the temporary fencing along ditches on park roads that has been set up to deter turtles from crossing and being run over. Nothing resonates more than the distinctive call of the loon in Algonquin Park. 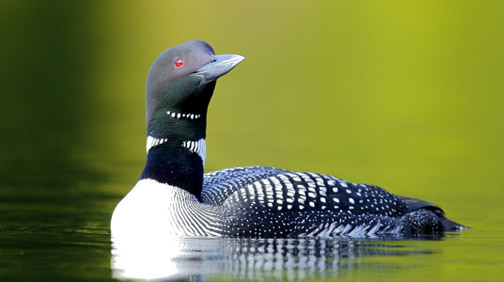 The common loon is a beautiful bird and shortly after they arrive in early spring they nest and have their young on Algonquin shores. If you are lucky you can see the young loons riding or wading behind their parents on an Algonquin lake. Certainly one of the more amazing Algonquin experiences is to have a loon dive beneath your canoe or kayak while paddling and come up with a nice fish. With over 270 bird species recorded in Algonquin, there is no shortage of bird watching opportunities. For those wishing to learn more about the birds of Algonquin Park, The Friends of Algonquin Park produce two publications: The Birds of Algonquin Provincial Park and Algonquin Park's Technical Bulletin – Checklist and Seasonal Status of the Birds of Algonquin Provincial Park. Both of these publications may be ordered from The Friends of Algonquin Park or bought at various locations around the park. Algonquin Park’s black bear population is very healthy and serves as a measure of the overall health of wildlife habitat in the region. Black bears are a fantastic mammal that instil fear in most people, but realistically they are very shy and avoid humans unless they have become habituated to a food source. Be sure to not leave food scraps of any kind at any campsite or picnic area to help keep bears wild. 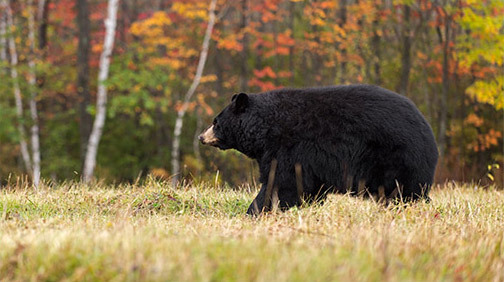 Bears can be spotted by chance as they occasionally cross Algonquin highways or park roads. Good viewing areas in early summer are found along logging cuts or powerlines when blueberries are in full bloom. In particular, the powerline crossing on the Major Lake/Shall Lake access road and the powerline crossing on the Barron Canyon/Lake Travers Road just south of Lake Travers are good places to spot these creatures.